Dyoung1987 - Brian Enos's Forums... Maku mozo! It’s the stock barrel. MOA Precision tapers their comp and threads the OEM barrel So that the slide & barrel have a tighter fit. My wife is running an XDm in 9mm with a custom muzzle brake from MOA Precision and a FF3. We have to hand load the Ammo to get the brake to work properly, but so far it is running flawlessly. Powder River Precision makes a great trigger for these guns as well. I own several XDm's and they all have their trigger installed. What's your favorite 9mm bullet for XDM? I've been loading the 115 grain Extreme Bullets for my Wife's XDm. I haven't had any issues. I see you are from Southern Ore. Medford or GP?? Just be advised that when you removed the factory XDm sight there is a spring and detent that will launch. They are an absolute pain in the A$$ to put back. Please learn from my misfortune. What happened to the xdm? Both my wife & I shoot XDm's. We love them. She shoots a tricked out XDm 9mm in Open class and I shoot a Production Class Xdm in .40. They are easy to mod and clean and have never given us any issues. Personally I'd rather spend the money on ammo getting better with these, then jumping to the new Fad gun every 3-4 months and having to start over. still seeing quite a few of them at local events. I can vouch for the Carhartt Storm Defender line of rain gear. I have 2 jackets. One I had originally purchased several years ago, then another one that is Hi-viz that was bought by the company I worked for. I also have the matching pants and the bids. If you are going to spend some money on good rain gear that will last you a long time this is the stuff. Just like "36873687" I've worked out side all day long in monsoon wind & rain and stayed completely dry. The exact route we went. I had a buddy of mine drill out the rear sight so that I could insert fiber optic rods. Just be careful when taking the rear sight off. There is a small detent and spring that like to shoot out of the sight. I've got PRP triggers in all of my XD's and love them. 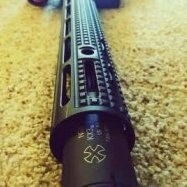 Which .22 trainer upper: Nordic, Taccom, CMMG? I'm running a Nordic components dedicated .22 upper for my son, so he can get used to the controls of the AR platform. We have run just about every type of Ammo through it, and He has even used it at several speed steel matches and it runs impressively well. I don't know about the magazine compatibility, we are using the black dog mags.